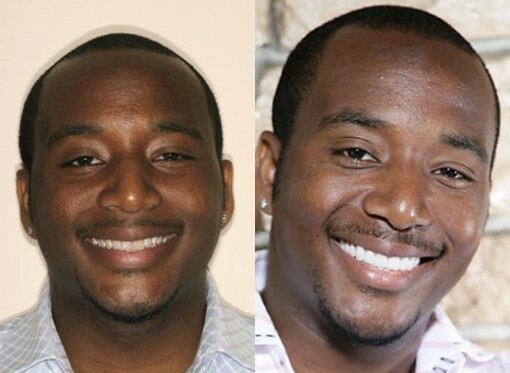 Nicholas Edon was thinking about cosmetic dentistry for several years. It wasnt a question of apprehension or affordability he was ready, willing and able but work got in the way. As a busy real estate professional, Nick is working all the time. It finally got to the point where I realized I had to sacrifice the time if I ever wanted to improve my smile. Nick saw an ad for Dental Spa & Beyond and visited on a hunch it might be what he was looking for. â€œThe facility was truly a spa. I loved the soothing atmosphere. I was so relaxed, I fell asleep in the chair and not because I was exhausted. It reminded me of how you feel after a massage treatment not a visit to a dentist. As a young boy, Nick had taken antibiotics that deposited a layer of medicine onto the developing tooth structure, permanently staining his teeth. Because this condition is typically unresponsive to conventional whitening, Dr. Gershkowitz recommended veneers. Full mouth construction was performed including 12 veneers on top and 10 on the bottom. During his treatment Nick became the victim of Dr. Gershkowitz perfectionist streak she was not completely satisfied with the results and redid the upper teeth twice. To me, it all looked good. But I appreciated the doctors extra attention to detail. Although his self image was always strong, Nick feels his new smile complements his profession. It was a matter of refinement, not a dramatic change… fine tuning, and touching up what I already had. Nick’s advice to those considering cosmetic dentistry? Just do it. Dr. Gershkowitz presentation and service is great. I know no other place you can go to get the same experience.